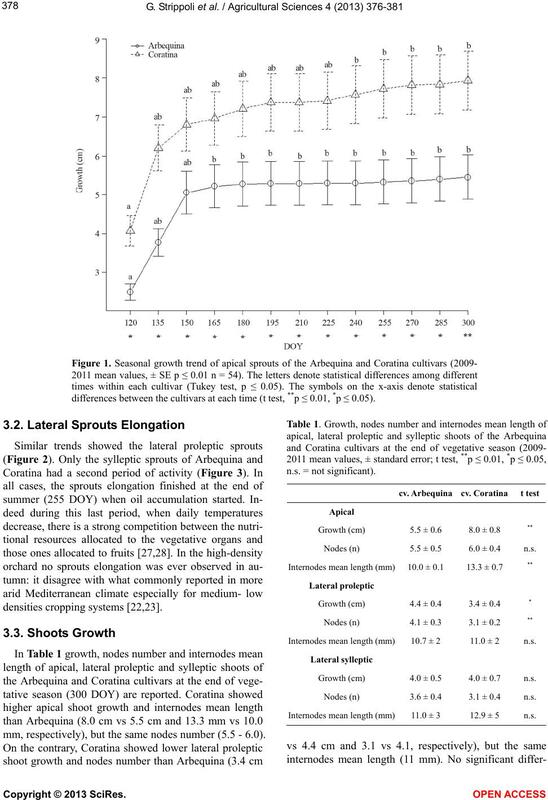 trends showed the lateral proleptic sprouts. as now required from Europe and from the market . fully assess its suitability for a high-density olive orchard. morphology was Goethe, the famous German writer . means of a repetitive process known as branching . very-low densities and rainfed cropping systems [22,23]. the apical or the lateral sprouts. measurement time t test was adopted. DOY) better following the general model (Figure 1). differences between the cultivars at each time (t test, **p ≤ 0.01, *p ≤ 0.05). Nodes (n) 5.5 ± 0.5 6.0 ± 0.4 n.s. Internodes mean length (mm)10.7 ± 2 11.0 ± 2 n.s. 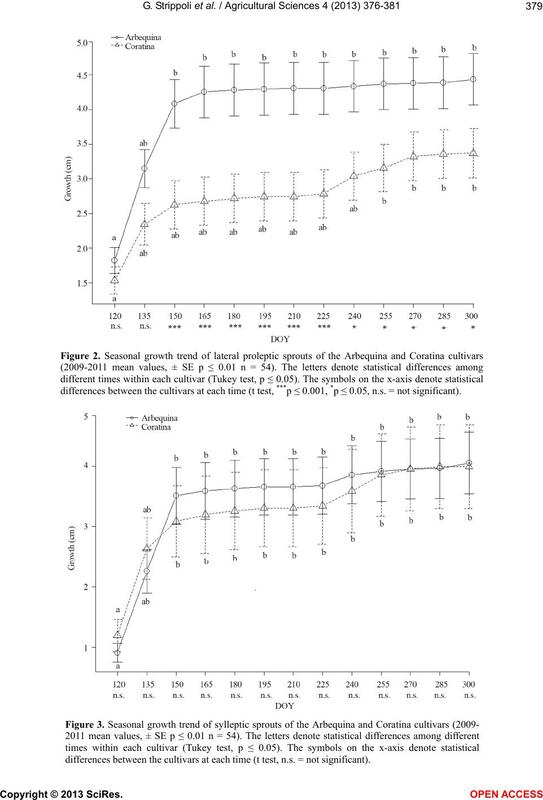 Growth (cm) 4.0 ± 0.5 4.0 ± 0.7 n.s. Nodes (n) 3.6 ± 0.4 3.1 ± 0.4 n.s. Internodes mean length (mm)11.0 ± 3 12.9 ± 5 n.s. mm, respectively), but the same nodes number (5.5 - 6.0). differences between the cultivars at each time (t test, ***p ≤ 0.001, *p ≤ 0.05, n.s. = not significant). differences between the cultivars at each time (t test, n.s. = not significant). concentrated and sped up in spring, particularly for the cv. an olive shoot under high-density irrigated conditions. then for new olive breeding programs. 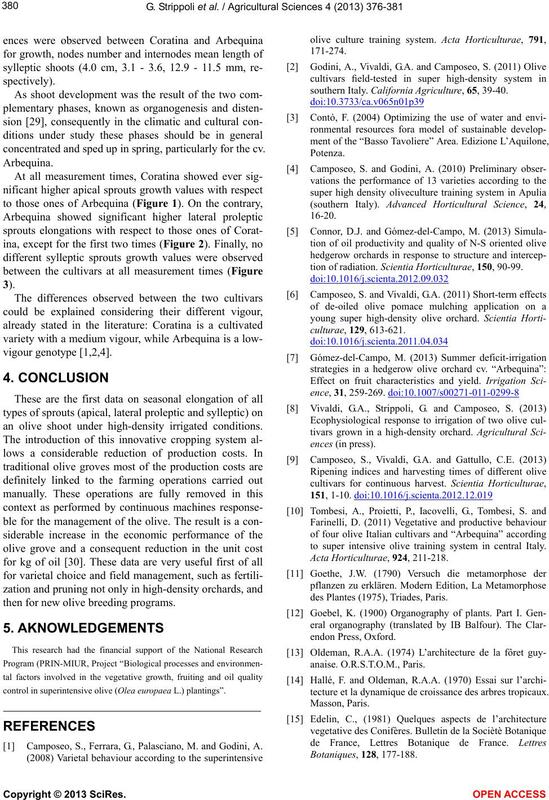 control in superintensive olive (Olea europaea L.) plantings”. Camposeo, S., Ferrara, G., Palasciano, M. and Godini, A.
southern Italy. California Agriculture, 65, 39-40.
tion of radiation. 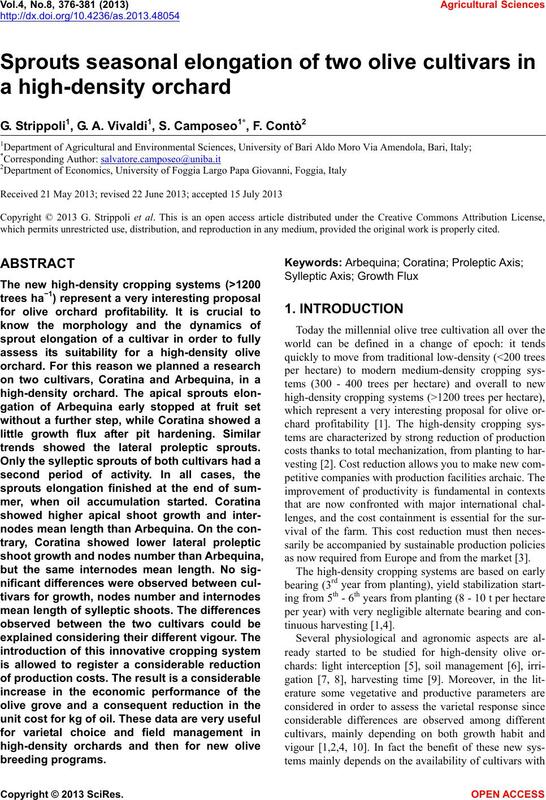 Scientia Horticulturae, 150, 90-99.
to super intensive olive training system in central Italy. des Plantes (1975), Triades, Paris. tecture et la dynamique de croissance des arbres tropicaux. génétiques chez de jeunes hêtres (Fagus sylvatica L.
cultural Science Biotechnology, 74, 110-117. Tropical trees and forests. Springer-Verlag, Berlin. of cultivation. 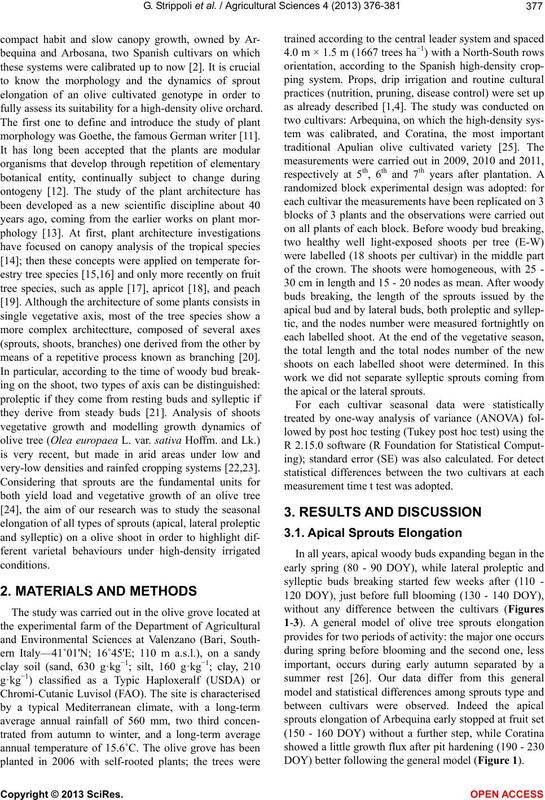 Advances Horticultural Science, 22, 8-12.
organs on branches. Acta Horticulturae, 636, 689-694. Camposeo, S., Ferrara, G., Palasciano, M., Godini, A. (2012) About the biological behaviour of cv. Coratina. bearing in fruit trees. 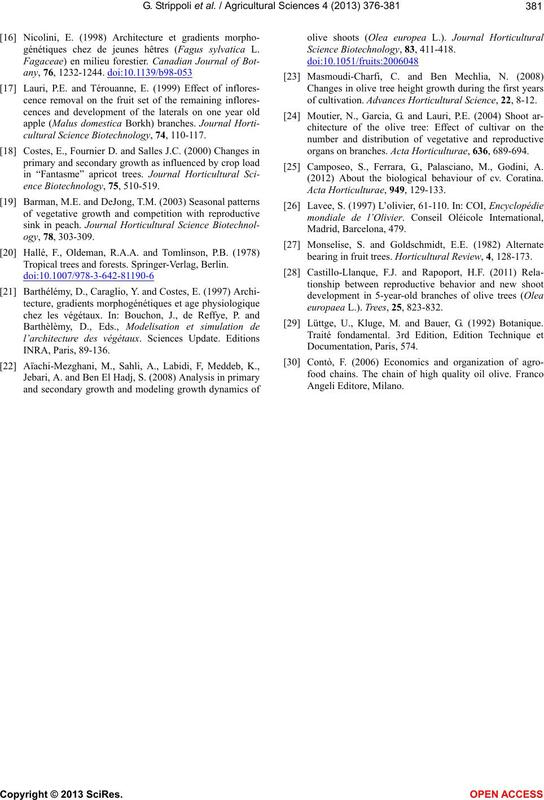 Horticultural Review, 4, 128-173.
europaea L.). Trees, 25, 823-832. Lüttge, U., Kluge, M. and Bauer, G. (1992) Botanique.